in serving our clients. All of us at Texas Coastal Living Properties are known for providing years of expertise and experience for our client's real estate needs and for bringing that friendly Texas personal touch to each transaction. 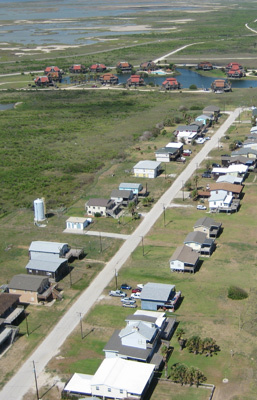 We work with our client's on a first name basis - learning about their objectives and making their needs and wants of owning property in the southeast Texas coastal counties come to fruition. Whether you are searching for the home or land of your dreams, a temporary home for job relocation, land to farm or ranch or business opportunities, working with a Texas Coastal Living Properties professional is your right choice. Texas Coastal Living Properties specializes in selling property in the Texas coastal counties of Matagorda, Brazoria, Jackson and surrounding counties of Wharton and Fort Bend. By working with one of our professionals at Texas Coastal Living Properties, you will have the advantage of accessing all local listings available through the Multiple Listing Services (MLS) of these Texas coastal counties. Contact us today to make those dreams and needs come true; we would consider it an honor to represent you. Lucy has been a licensed REALTOR® since 1983 and broker since 1985. She has been working in real estate or involved in real estate related professions since 1983. Her experience ranges in residential resale, custom home construction and sales, property management, loan origination and as a licensed escrow officer. Lucy has been very involved in real estate organizations. She is a member of the Women's Council of Realtors where she served as past president of the Ft. Bend Chapter Women's Council of Realtors, Texas District Vice President and National WCR Governor as well as committee chairman or member of many committees on the local, state and national levels. She has been active in the Houston Association of Realtors serving as past chairman of the Ft. Bend Division of the Houston Association of Realtors and member of the PAALS governing group. Lucy and her husband, Jim, have lived or owned a second home in the Texas coastal area all their lives. She is a member of the Matagorda County Board of Realtors, the Brazoria County Board of Realtors, the Houston Association of Realtors, the Texas Association of Realtors and the National Association of Realtors. Call Lucy at (281) 851-8142. Karen has been a licensed REALTOR® since 2007. Her real estate background started long before that working in the local law office of W.A. Orr for over 30 years where she assisted many coastal area citizens close their real estate transactions. Karen brings a great understanding of the local real estate market and dedicates herself to personal service with utmost ethics and professionalism. She is a member the Matagorda County Board of Realtors, the Brazoria County Board of Realtors, the Texas Association of Realtors and the National Association of Realtors. Call Karen at (979) 240-3658. Charlene has been a licensed REALTOR® since 2007. She grew up in Brazoria County and now resides in Matagorda County. Her knowledge of these areas helps her provide that personal touch to the clients she works with. Charlene has spent many years volunteering and organizing charitable events. Her compassion to help people and her organization skills are an asset to the clients she works with. She is a member the Matagorda County Board of Realtors, the Texas Association of Realtors and the National Association of Realtors. Call Charlene at (979) 479-4633. Dot began her real estate career as a licensed REALTOR® in the late 1980's. She uses her broad background in public relations to represent the individual needs of each of her clients. While her specialty is in residential buying, selling and re-locating, she is also experienced in commercial real estate. Even though she has extensive and proven success in these areas, her strongest asset has to be her ability to meet the needs of her clients. She does this so well, that the vast majority of her new clients are referrals from previous clients. She is known in the industry as one who is willing to go the "extra mile" to see that her clients are satisfied. She is quick to understand the needs of both the Buyer and Seller and is genuinely enthusiastic to see those needs met. Dot is a member the Coastal Bend Board of Realtors, the Texas Association of Realtors and the National Association of Realtors. Call Dot at (832) 512-8269.